Honesty Shop In School In India Aims To Teach A Valuable Lesson : Goats and Soda At St. Claret's School in India, snack time is time for an ethical decision. Students could toss a few coins in the box — or just take the food and walk away. Children select a snack at St Claret's school in the southern Indian village of Karumathur. And then it's up to them whether to do the right thing and pay up. Let's say you're a student in class. There are boxes full of delicious snacks on a table in front of the room: muffins, peanut brittle, candy, samosas (deep-fried potatoes wrapped in a packet of dough). There's a money box next to the snacks. It's up to you whether to pay or not. And nobody's watching. Would you be an honest citizen and toss some coins into the box? Or would you walk off with a snack without chipping in? That's the premise of the honesty shop – an unattended business that relies on the customer to do the right thing. Schools have, for some years, been experimenting with honesty shops in a part of India where theft was so commonplace in the past that the people who lived in this community were called kallars — a Tamil word that means "thief." And India itself isn't exactly known as a paragon of honesty. In a survey published last year by Transparency International, the country ranked 81st out of 180 countries for corruption. Indians who were polled as part of the survey were asked to grade their country's corruption on a scale of zero (most corrupt) to 100 (very clean). India got a 40. Yet at St. Claret's in the southern Indian village of Karumathur, the school's honesty shop just had its most ... honest ... year ever. Since the shops were begun in 2004. the average annual loss is $28. In 2008-2009, the figure rose to $85. But it's significantly declined since then. And in the school year ending in 2017, it was $13, with most classes registering perfect accounts. The man behind the honesty shops was Father Ansel Mus, a priest who founded the school in the 1980s to serve rural and low-income students. He was aware that these children lived in an area regarded as a high-theft district and that they faced many prejudices because of that. "Father Mus wanted education to provide values that could help with life," says the current headmaster, Father Soosai Manickam. "He had read about the concept of honesty shops and wondered if we could implement it." Here's how it works. Two students from each class make a note of the money collected each day and hand the cash over to a teacher. Accounts are monitored each Monday. If a class has shown a shortfall, the students are counseled at an assembly where the whole school has gathered. Harsh words aren't uttered. Rather, says English teacher Vanithamani Thangamuthu, students are urged "to be more honest next time." Manickam says next school term, which starts in January, "instead of naming the classes that have shown a deficit and telling them that they can do better, we intend to praise the ones that have been completely honest." Students are not asked to contribute to make up any shortfall. 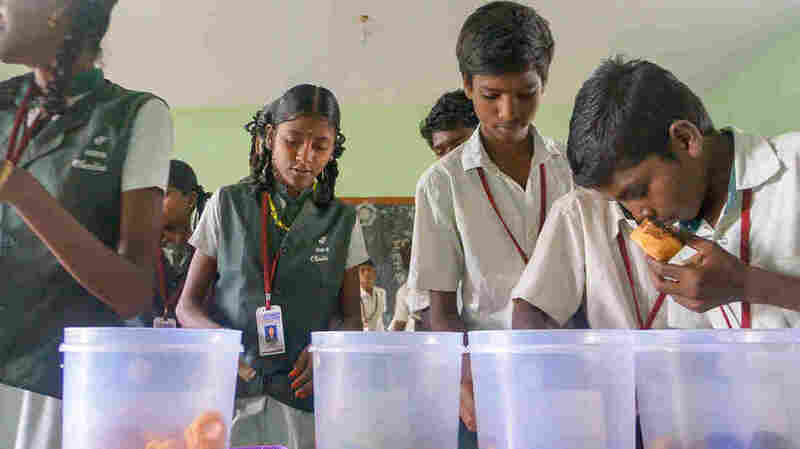 "If we asked the children to reimburse the amount, even the honest children would have to pay for their classmates' mistake," says Thangamuthu. "We don't want it to be a punitive exercise in any way." The idea has spread. "This is our sixth year of running it," says Father J. Joseph Victor Das, principal of St. John's school in Madurai, 20 miles from St. Claret's. Giving children the freedom to make mistakes — and to correct themselves — is important, he says, because that's the key to changing the culture in a country. "And it works because it makes honesty a team effort," he adds, "rather like a sport." As for an indication that the impact extends beyond the shops, administrators at St. Claret's offer two anecdotes. In October this year, 13-year-old Kabila Kannan, an eighth grader at St Claret's, lost her gold pendant at school. It was in the shape of the elephant headed Hindu god Ganesha, and it meant a lot to her. After a day of frantic searching, teachers made the announcement about the missing pendant at assembly. That very afternoon, two boys, Sivakarthikeyan Angeeshwarar of grade 9 and Sivanandi Pandi from grade 6, caught sight of a flash of gold on the sandy grounds. It was the pendant, which they immediately returned. Kannan's father was so touched that he insisted on honoring the boys for their honesty. He bought presents and wrapped silk shawls around them, a gesture of respect. "The biggest lesson we've learnt from the honesty shops is that being honest is a choice, and it should extend to all aspects of our lives," says Angeeshwarar. "It's not just about snacks. It's about knowing the right thing to do." Five years ago, two boys from St. Claret's, Raman Maruthupandi and Karthik Pandi, both age 10 at the time and working at an after-school job, made the news when they returned a purse that they'd found wedged under a chair — with $1,000 inside. Even students who have graduated say the experience was life-changing. Pasumpon Veeranan is a local policeman who graduated from the school in 2010. He's a fan of the shops. "If you can be honest in small things, you tend to be honest in the bigger things as well," he says. And that's not the only way the shops influenced his life: "Honesty shops inspired me to get into policework."